vvme FTW ive had three sets on three different cars of mine and they all worked flawlessly. cant beat the price, quality and rush shipping. Ok i looked on VMEE.com and hidkit.com. but im not sure if im looking for just the light bulbs or if im looking for like a kit?? I think 8000K is the furthest anyone should go. Anything more then that is too dark of a blue or purple!!! I'm running on (icy blue) 8000K 55W ballast in my heads and (yellow) 3000K 35W ballast in my fogs!!! Love that combo ever since!!! 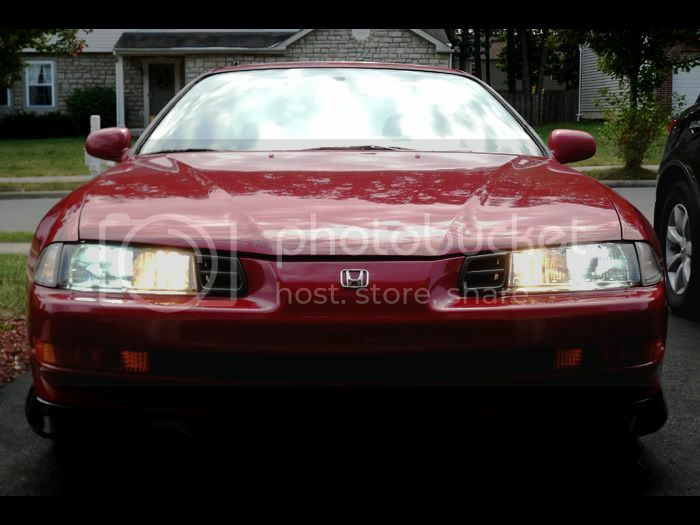 I found a kit that is 80$ for both the low beam and the high beam.. is that an average price?? and should i go 6000k for both or should i switch it up? I wouldn't put HID's in my high beams. HID's are not meant to be turned on and off frequently, as you would be when signaling someone by flashing your high beams. MAKE SURE you get the "recommended" wire harness; which is to be wired to the battery. I bought this kit. It's a little more expensive, but worth it. Also, I live in Utah too. EDIT: Forgot to add this, I got 8000K too. It looks INSANE with my yellow JDM fog lights. There's less "white" in 8000K bulbs and higher...So anything past 8000K would be taking away from your visibility. Last edited by Vanz__; 10-26-2010 at 02:19 PM. I'll definately take a look at those I feel more comfortable buying those then some others just cause this website tells you what you get.. I'll probably get 6000k ones but what is the HID wiring harness?? Do you get that?? How do you do HID's on both high/low being that they are separate bulbs? Is there a way to do this without having to get two kits? Well, I mean your high beams are positioned at a higher shooting point than your low beams. So even if you have 6000k 55w HID's for low beams and stock high beams, you'll still have further visibility with your high beams on. Im prob just gonna go with 6k low beams.. When I had my HIDs installed I had 6000k 35w for my low beams with the wiring harness from DDM Tuning and left my high beams stock. I LOVED the way they look. I can't wait to get my JDM style one-pieces and install them again. And you really don't need 55w. I recall seeing somewhere that 55w can actually produce less visible light. But don't quote me on that. well idk if it matters but im rockin a 5th gen, what do you recommended 35 or 55w? 4th gen or 5th gen, it doesn't matter. I'd still recommend 35w. But I would recommend getting the wiring harness as well. Most people who don't find that their lights will either flicker while driving, or they will take a couple tries to turn on. HIDs require more power from the battery than stock headlights so instead of trying to push all that electricity through the stock harness, you use electricity directly from the battery. You're welcome. Good luck with your decision. So wiring harness are more then the HIDS themselves arent they? Get these. 35w, H1, 6000k, HID Harness. You don't need the CEL eliminator nor do you need the H1/H7 to 9006 adaptor cables. They're $37.50+shipping. Best price I've found, best HIDs I've had experience with. Shweet. Take some pictures afterwards of them installed. For sure. sorry i dont have any right now posted.. My mom gets home tomorrow from business trip and she has the camera!! I love this sight!! !